The first thing to set up is the Control Record. Go to Back Office - Accounts Payable - Accounts Payable Processing. At the Accounts Payable Processing menu, select #6, Set-up control record. Your cursor will be at "Ok?". Type the field number to go to, starting with 1. 1. 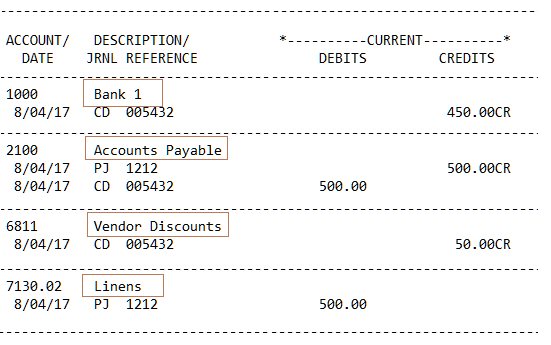 A/P control account - Enter the general ledger accounts payable control account. This is the account that will credit when an invoice is created and debit when an invoice is paid. 2. Discount account - Do not use this field until you read and understand Discount Setup and Discount Procedures. 3. 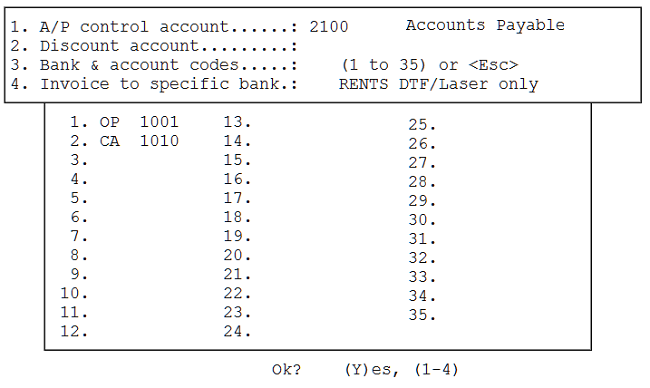 Bank & Account codes - You may have up to 35 bank accounts from which you pay vendors. Type the bank sequence to use. For example, to enter the first bank, type 1 and press Enter. Your cursor will go to that field. Type a code up to three letters to represent this bank, such as OP or NBF. 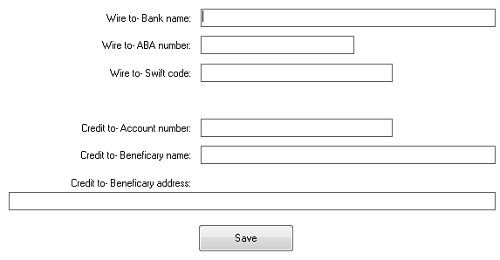 Press Enter and your cursor will move to the next column, Type the GL account number for that bank and press Enter. Your cursor will return to Field 3 in the top section. Continue entering banks by entering the next sequence number. Press Enter when you are finished. When processing checks, the default will be 1, but you may select any that exist in this record. To remove a bank, type # in that field and press Enter. For example, to delete OP, when your cursor is in that field type #. You will not use Field 4. When you are finished and your cursor is at "Ok? ", type Y and press Enter. Go to Back Office - Accounts Payable - Accounts Payable Processing. 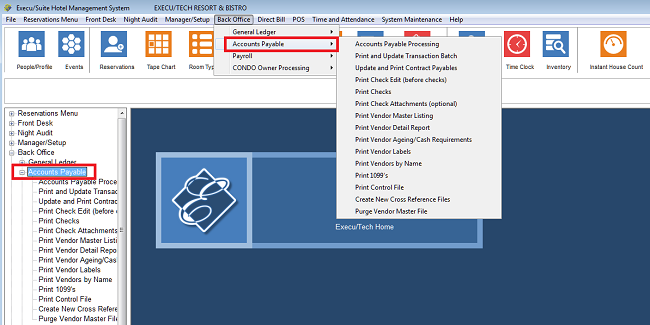 At the Accounts Payable Processing menu, select #1, Set-up vendor master. At the prompt, enter the code for this vendor, up to five characters. To look up an existing vendor, type L and press Enter or click Look-up. If you enter an existing vendor code, the setup for that vendor will display. If you are setting up a new vendor code, a blank screen will open for you to enter the new vendor. The Vendor code may be up to five characters. A vendor code cannot be changed; it is the record key. Fill in the Name, Address, City, State, and ZIP or Postal Code. 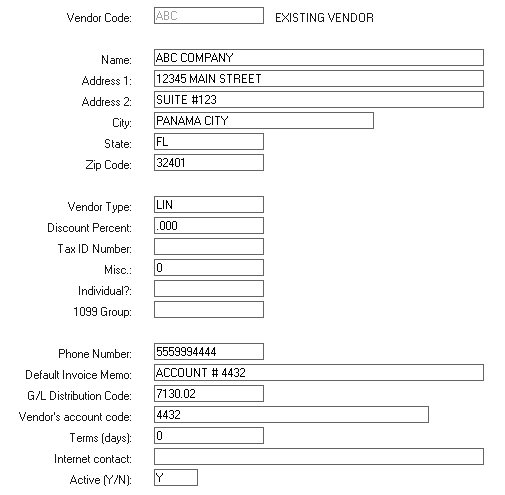 Vendor Type - Enter an option three-character vendor type such as LIN, OWN, UTI. This will be helpful if you wish to print reports by vendor type or pay vendors by type. Discount Percent - Enter the discount percent for this vendor, such as 10.5 for 10.5%. Do not put anything in this field until you read and understand Discount Setup and Discount Procedures. Tax ID Number - Enter the nine-digit business Tax ID number or individual SSN if this vendor is to receive a 1099. Do not enter spaces or punctuation. Format: 987654321. If you will not print a 1099 for this vendor you may leave this field blank. Misc. 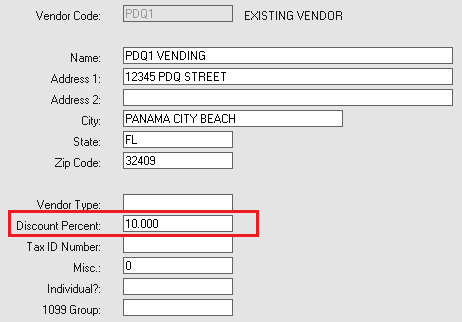 - Only fill in this field if you need this to go on the "Misc" field in the vendor's 1099. If you will not print a 1099 for this vendor you may leave this field blank. Individual? - Answer Y is the "Tax ID Number" is the vendor's social security number. 1099 Group - When you get to this field, your options will display, as shown below. Most vendors will be a letter A - Z. For Condo owners, enter 1 in this field. Phone Number - Enter up to ten digits. Default Invoice Memo - You may enter the text you would like to print on the memo line of the check. G/L Distribution Code - You may enter a default G/L Distribution code for this vendor. This saves time when entering invoices. Typically this would be a liability or expense account. Terms (days) - You may enter the terms for this vendor's invoices in number of days. Internet Contact - You may enter a website or email address. This is informational only. Active (Y/N) - If you no longer wish this vendor to be included in reports, or look-ups, enter N in this field. Save will save this vendor and prompt for the next vendor. At the prompt, you may press Esc on your keyboard if you are finished entering vendors. Cancel will exit without saving. Delete will delete this vendor. You should not delete a vendor with detail. Notes will pop up a window where you can add notes about this vendor. Invoice will take you to the invoice entry screen. Bank Info will pop up the following window. This is informational only. Contract Payables is an easy way to process recurring invoices such as auto payments. This eliminates the need to enter the invoice each month. Go to Back Office - Accounts Payable - Accounts Payable Processing. At the Accounts Payable Processing menu, select #6, Set-up contract payable. First Payment Date - Enter the date that the first invoice should be created. When you run "Update and print contract payables", an invoice for this contract will not be created before that date. Number of Payments - Enter the number of payments. The system will stop processing this contract after the designated number. 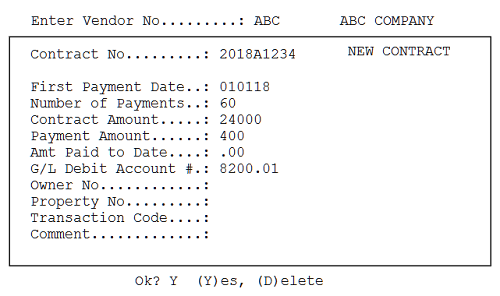 Contract Amount - Enter the contract amount. The system will stop processing once this amount is zero. If a partial amount is due in the final payment, only that amount will post. Payment Amount - Enter the amount of each payment. Amt Paid to Date - Enter the amount paid to date. This figure will change as you process this contract each month. G/L Debit Account # - Enter the G/L account, such as an expense account, for this contract. Leave the following fields blank: "Owner No", "Property No", "Transaction Code". Enter Y at the "Ok?" prompt to save. There are two ways to apply vendor discounts. The first way is to apply the discount globally (for vendors receiving discounts). This requires a General Ledger "Discount" expense account. The second way is to apply the discount per invoice. For this discount, you may apply one global GL account or separate GL "Discount" expense accounts per invoice. The first way is recommended. If you process discounts other than these two methods, you are doing it wrong. Step 1: You will assign one General Ledger account for all discounts. This is done in General Ledger Processing - Account Setup. 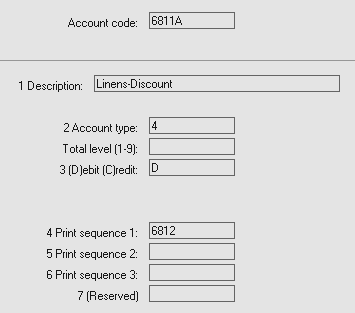 Step 2: The GL Discount account code will go into the "Discount account" field in the A/P control record. This is in Accounts Payable Processing - Set-up control record. 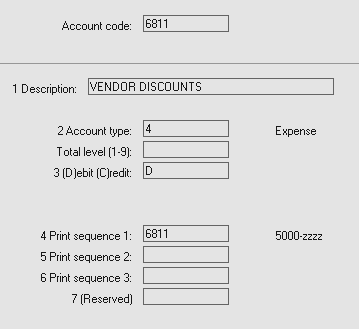 Step 3: You will assign a discount percentage for each vendor, as appropriate. The discount will not apply to any vendor without a specified discount. Go to Accounts Payable Processing - Set-up vendor master. The discount will be applied when the invoice is paid. See Accounts Payable Processing. Whether you print the checks or enter manual checks, this is what you will see in General Ledger when you are finished. In the "REFERENCE" column, 1212 is the invoice number and 005432 is the check number. The invoice was created first and then the invoice was paid. This example uses the "global" discount GL code. Method 2 allows you to assign a GL account for each vendor. With this method, you will NOT enter the GL Discount account code into the Accounts Payable control record. You will NOT assign the discount percent in the vendor setup. You will only create a GL account to which to post the discount. After completion of Month-end Steps 1 and 2 are completed, month-end Step 3, "Create A/P Entries" creates A/P invoices for the "due to/from" sum for each owner/vendor. If you owe the owner, an invoice is created to be paid at the appropriate time. If you owe the owner/vendor, a credit invoice is created. A credit invoice will "sit" until the owner/vendor has a positive balance which is paid to the owner, or until you receive payment from the owner. A payment to owner processed in Accounts Payable will update to Condo, creating a transaction against the "due to from" sum. A payment from owner processed in Condo will update Accounts Payable applied against the vendor balance including credit invoices. Invoices entered into A/P, such as utility bills, can be split between condo owners, creating expenses in the individual owner accounts in Condo. When Purchase Orders are received in inventory, A/P invoices can be created automatically. We recommend NOT using this option unless the person responsible for inventory processing is also responsible for accounts payable processing. We also recommend NOT using this option if delivery manifests or invoices do not include all charges such as shipping. Otherwise you would have to either create a second invoice for the additional charges or credit the first invoice and re-enter it. This integration is offered as an option but we recommend all A/P invoices be entered directly into A/P rather than allowing the inventory module to create them. Make sure to assign appropriate General Ledger codes when you set up inventory. Make sure the inventory item setup includes valid A/P vendor codes.